There are so many amazing offers and stuff going on in October I felt like I needed to do an entire blog post just listing out all the awesomeness. Make sure you read all the way to the bottom because I have blog candy. You will want to leave a comment on this post, but won’t know what to comment unless you read all the goodies! See how I get ya! Stampin’ UP! is offering some great deals for World Card Making Day. This offer is only good through October 7th. CLICK HERE to check out all the discount items. 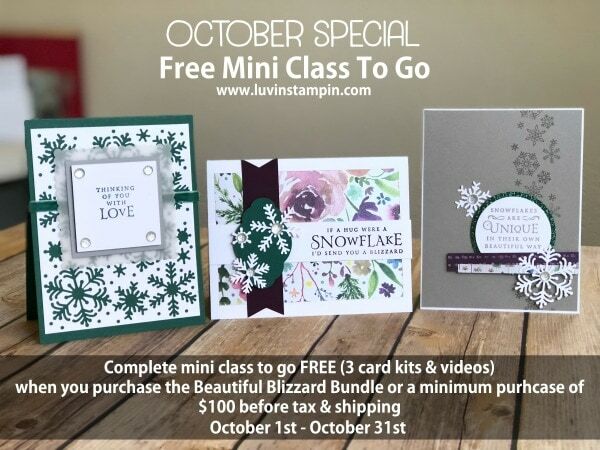 I have a special this month where you can get a free mini class to go when you place an order of $100 or more. CLICK HERE to place an order. 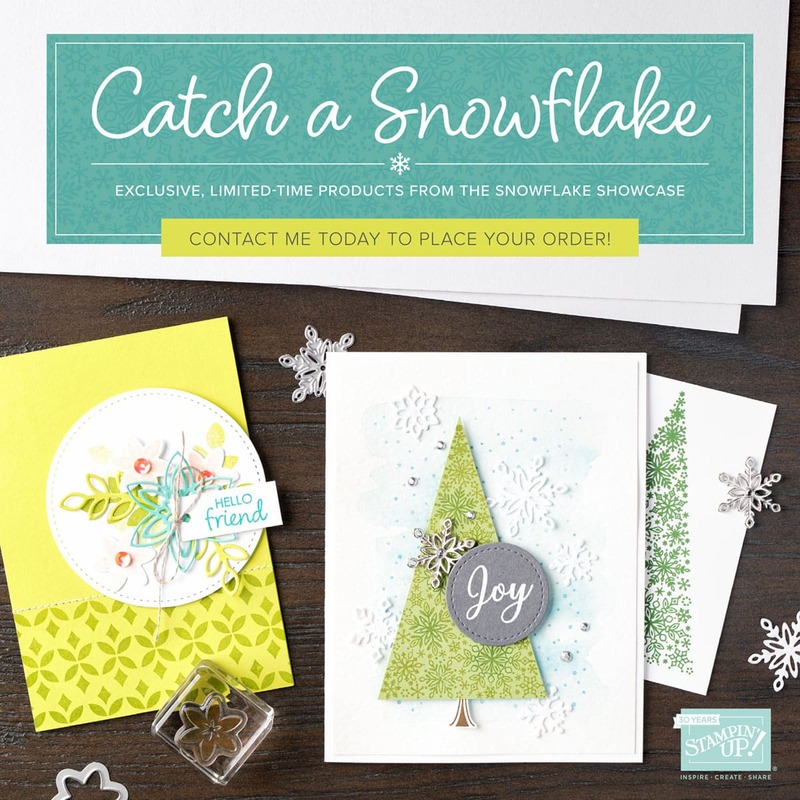 The beautiful Snowlake products will not be available for sell until November 1st. HOWEVER, you can get all the items NOW if you purchase the starter kit. CLICK HERE To watch the video showing you all the goodies. This is a Facebook live replay. 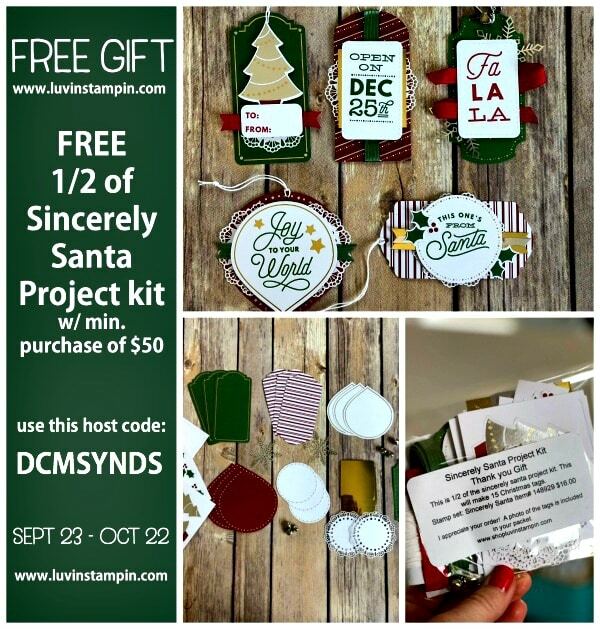 Get 1/2 of the Sincerely Santa Project Kit FREE when you place an order of $50 or more with me before October 22nd. Make sure you use this host code if your order is less than $150.00. WHEW! I think that’s everything. That’s a lot. But all fun stuff. 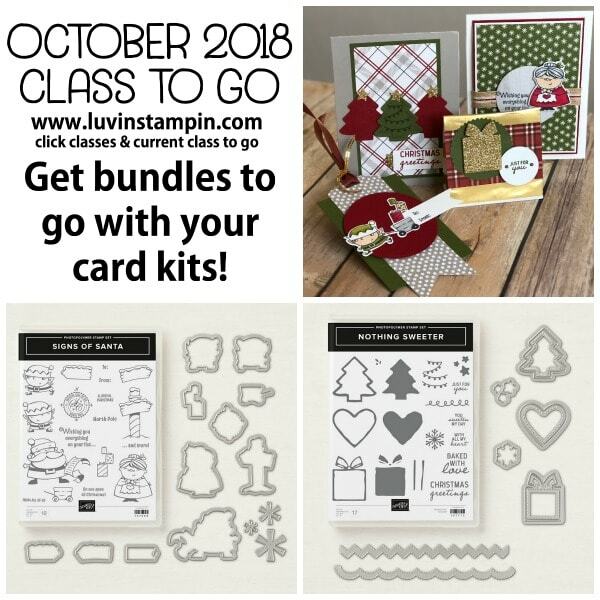 Just when I think I am close to a completed holiday catalog wish list/purchase, Dtsmpin Up comes out with another cute bundle set! Gosh darn it!!! Lots of great information! Thanks for sharing. I received my sample paper =, thank you. Problem, it smells bad. Did anyone else notice that? I may have missed the solution. What can I do? I can’t use it this way. Sorry, it’s beautiful. Thank you, Wendy for always sharing and keeping us updated with all the news. Look forward to your emails and posts.